Plus, will the Real defeat have a psychological impact on Barcelona. 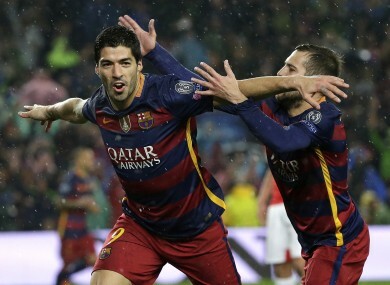 Luis Suarez and co will be looking to bounce back from last weekend's defeat to Real Madrid. 1. Can City redeem their season? THEY MAY HAVE won the League Cup, but by the lofty standards to which they aspire, it’s been a disappointing season as far as Man City are concerned. Perhaps negatively affected by the news of new manager Pep Guardiola’s impending arrival in the summer, the Etihad outfit have stuttered after a promising start to their league campaign. City sit 15 points behind leaders Leicester and no longer have a realistic chance of winning the league. Indeed, they are even in danger of missing out on a top-four spot, with Man United and West Ham one and four points behind them respectively. The Champions League could redeem their campaign, however, after they reached the quarter-finals for the first time in their history recently. Yet City are bound to endure a sterner test against Chelsea’s conquerors PSG, having overcome a weak Dynamo Kiev side in the last 16. 2. Will Real defeat have a psychological impact on Barca? Up until recently, it would fair to say Barcelona’s season could hardly have gone much better. Yet Saturday’s 2-1 loss to Real Madrid is the first hiccup for a Barca side whose 39-match unbeaten run was ended in ignominious fashion — at home against their bitter rivals who had also been reduced to 10 men. And while the result may not have much of an impact in terms of the league — Barca are still six points clear with just seven games to play — the long-term psychological impact of this somewhat embarrassing defeat may be significant. Having been constantly told they are invincible and ‘arguably the best team in history,’ Luis Enrique’s men will suddenly be feeling mortal after being brought down to earth by Zinedine Zidane’s side. The Catalan outfit face a similarly tough test against an Atletico Madrid team, who they have found it difficult against the two occasions they have met in the league, with Barca twice prevailing 2-1. Consequently, anything other than a victory for Barcelona will inevitably lead to people questioning whether they are beginning to feel the weight of history, as they bid to secure unprecedented back-to-back trebles. Bayern Munich face Benfica tonight at the Allianz Arena in a game in which they will be hoping to establish a healthy first-leg advantage. After all, going to Portugal for the second leg probably won’t be easy — at this stage last year, the Germans were beaten 3-1 by Porto, before securing an emphatic 6-1 second-leg home victory. Pep Guardiola’s men will be without Arjen Robben, who is suffering from a groin injury, but Kingsley Coman, who starred in the thrilling last-16 comeback against Juventus, is expected to feature after recovering from a leg injury. Wolfsburg have been one of the more unexpected success stories in the Champions League this season. Despite finding themselves in an underwhelming eighth position in the Bundesliga currently, their indifferent form has not been so evident in Europe. Dieter Hecking’s side finished top of their group, knocking out Man United in the process, and also earned a deserved 4-2 aggregate victory over Gent in the last round. They will face undoubtedly their biggest test yet against a Real Madrid side that will likely be in buoyant mood after ending Barca’s 39-match unbeaten run at the weekend, but with magisterial 22-year-old attacker Julian Draxler surely destined for bigger things, Wolfsburg may not have a better chance of reaching the Champions League semi-finals for quite some time again. Email “Test of Barcelona's character and more Champions League talking points”. Feedback on “Test of Barcelona's character and more Champions League talking points”.